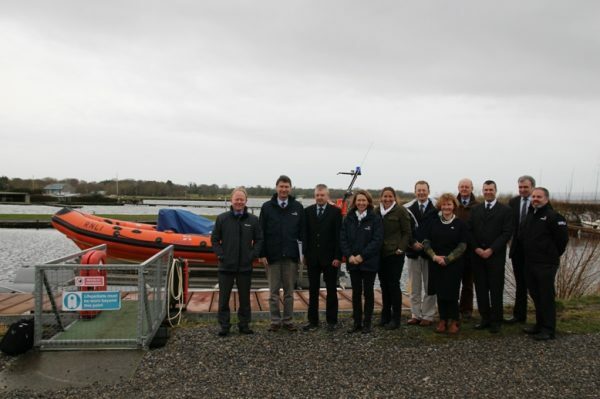 Members of the RNLI Coast Review group were in Dromineer on Thursday January 23, to carry out a formal review of the Lough Derg RNLI lifeboat station. Lough Derg RNLI station was the final station for review by the group, which had visited a number of stations in the south of Ireland. Prior to their arrival at Lough Derg, the delegation had met with the Irish Coast Guard Search and Rescue Helicopter team based at Shannon. Members of the RNLI Review group who visited Lough Derg today included George Rawlinson, Operations Director, Tim Laurence, Chairman of the Operations Committee, Charles Deakon, Operations Committee, Richard Ibbotson, Operations Committee, Fiona Fell, Operations Committee and Dee Caffari, Operations Committee. Accompanying the group were Owen Medland, RNLI Divisional Operations Manager, Declan Dixon, Divisional Engineer, Ronan Boyle, RNLI Divisional Operations Manager for the South Coast and Helena Duggan, RNLI Divisional Assessor Trainer. John Coyle, Chairman of the RNLI Irish Council, and Niamh McCutcheon, Council member and Chairperson of Nenagh Fundraising branch were also present. The group met with the station’s Operations Committee, volunteer lifeboat crew and fundraisers, to update everyone on the progress of the new permanent boathouse for Lough Derg in Dromineer village. The group listened to and engaged volunteers on their thoughts on the daily running of the station. They sought information on the crews observations regarding the boat and equipment used at the station and enquired about the types of services the crew respond to. They asked about the station’s work and training with other agencies on the lake. The group also discussed the training undertaken by crew at the station and the RNLI online resources available to crew for training. Tim Laurence, Chairman of the Operations Committee, thanked all of the volunteers for their commitment and time. He also recognised the great efforts of the local fundraising committee.